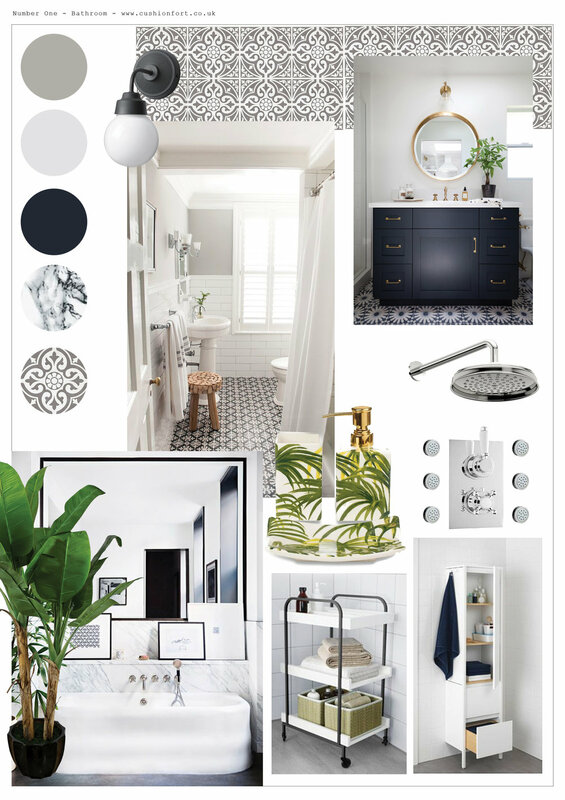 The mood board for the main bathroom was the first one that I was drawn to complete, although it's probably the last room that we will tackle. I have a strong vision for what I want to create in this space, but for now quick fixes are what's going to count, as sorting the dodgy plumbing work will mean the bland beige tiling will have to be ripped out (how unfortunate...). This is obviously going to take some cash, which we are planning to save up to tackle once our downstairs utility becomes a wet room! It's true what they say, there is always something to do when you own a home. For the meantime, I thought I would share some quick fixes I plan on making in the bathroom to make it a bit more liveable as they might help you too! Frosting the windows is a quick fix for creating privacy without having to change old windows. You could get an additional update by painting the window frame first to clean up old windows and then grab some frosting sheets from your local hardware store. These are applied to clean windows, with a hair dryer, and this can seal draughts as well as obscuring any over lookers! 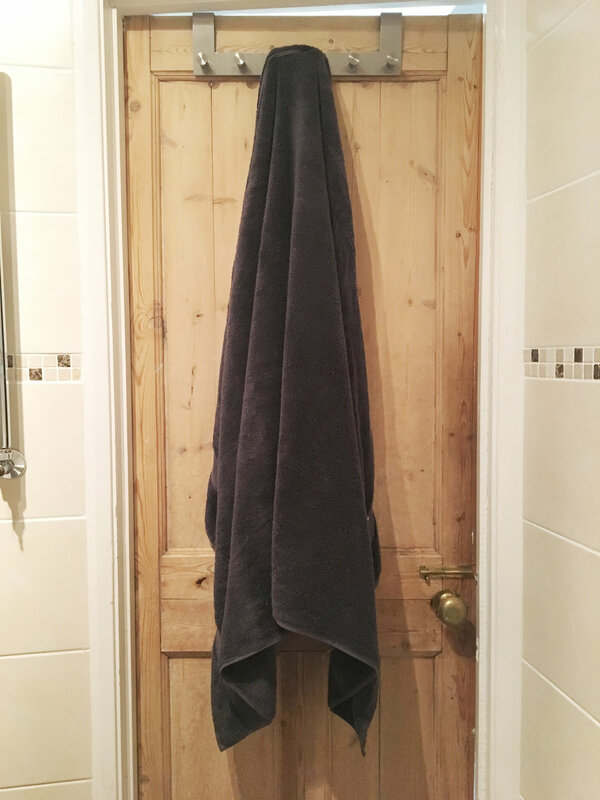 As a first time buyers, often price is key; however, when it comes to bath towels try and stretch the budget a little bit! I found a bargain in Tesco - dark grey Egyptian cotton, which are lovely and soft on your skin. Choose a dark colour, so they look more luxurious hanging up in the bathroom for longer. Buy the largest size, normally called 'Bath Sheets' instead of your normal bath towel size. There is something so decadent about wrapping up in lots of soft cotton after a relaxing bath, and for a couple of pounds extra it's totally worth it! They look more sumptuous hanging on the back of the bathroom door too...bonus! It might be worth getting a handyman or plumber in to take on any annoying issues like shower thermostats problems, dripping taps and other plumbing difficulties. You could even get the side panel of a bath changed or upcycled to give the area a new lease of life. We need to get our toilet bolted down...don't ask! As well as the thermostat checked on the shower, but when they are done bathing will be much more relaxing! Make the space your own by adding your favourite scented candles and oxygen producing plants. Remember to light the candles before you have people over, this makes the bathroom feel looked after and more of a pleasure to use. My favourite bathroom scent is Jo Malone's PIne & Eucalyptus or Wood Sage & Sea Salt, although they're a bit pricey they do last for ages. Everytime I go to visit family in the States I drop into Bath & Bodyworks and pick up as many candles as I can fit in my luggage as a cheap fix. My favourite scents there are Mahogany Orchard (my current bathroom scent! ), Sweater Weather and Twisted Peppermint for the festive season. The ultimate step to a luxurious hotel-style bathroom is to minimise the clutter. I am terrible for hoarding cosmetics, but after seeing a friends immaculate bathroom I have resigned myself to limiting the products out and using them up before putting out or buying anymore! You could get even more chic by rebottling your lotions and potions into uniform bottles and labelling them! Do you have any tips for creating a luxurious bathroom on a budget? I'd love to hear them over on the Cushion Fort Facebook page!